Photographer, St Pancras (and briefly also at South Street), Chichester. Frederick Henry Robinson was born at St Leonards in 1862. His father, Frederick Robinson, who had been born at Pulborough in about 1825, is listed in the 1861 census as a cordwainer (shoemaker) employing 2 men and a boy. His mother, Ann Amelia Robinson (formerly Scott), came from Ore. The family lived at 10 Undercliff Terrace in St Leonards in 1861, but by 1871 moved to 21 Alma Terrace in the Silverhill area, and by 1881 to 6 Overton Terrace. Frederick and Ann Amelia Robinson had at least nine children - four boys and five girls - between 1852 and 1872. Frederick Henry was their fifth child (and third son). By 1881 he had left home and was lodging with a family in Russell Street in Hastings while working as a shoemaker. He is believed to have married Elizabeth Mary Ridley from Peasemarsh near Rye in 1882 or 1883, though for some reason the General Registry Office did not record the marriage. Elizabeth had been working as a domestic servant in Hastings. She had been born in 1859 and was the daughter of Jane Ridley, an unmarried farm worker. Frederick Henry and Elizabeth Robinson's first son, Frederick Henry Robinson junior, was born on September 25, 1883, at the couple's home in Rumboldswhyke in Chichester. The birth certificate confirms that Elizabeth's maiden name was Ridley. Elizabeth went on to give birth to three more sons: George Robinson in about 1885, Rupert Robinson in 1886 and Cecil Ridley Robinson on April 10, 1893. When the 1891 census was held, the Robinson family was living at a house in Orchard Road in Rumboldswhyke. Although Frederick Henry Robinson began his working life in Hastings as a shoemaker, he abandoned his father's profession on moving to Chichester where he joined one of the established photographic studios. In 1895 or 1896 he set up his own photographic business at 5 St Pancras on the east side of Chichester, which also became his home. The 1901 census records that his son, Frederick Henry junior, had become a coachsmith's apprentice, George was a hairdresser's apprentice, while Rupert assisted with the running of the studio and shop. Cecil was still at school. Frederick Henry Robinson was a talented and successful photographer, who produced large numbers of cartes-de-visite and cabinet portraits, some of which were of outstanding quality. As his business grew, he was able to create more room for his shop and studio by acquiring the next-door property of 6 St Pancras. When the 1911 census was held, Frederick Henry and Elizabeth Robinson were still living at 5 and 6 St Pancras, either over the shop and studio or at the back. His four sons had presumably left home, but the census index makes no mention of them. Perhaps they were abroad. Robinson is believed to have retired in about 1914, though he was only about 52 years old. He died in 1929 at the age of 65. Although Frederick Robinson was mainly a studio portraitist, he sometimes took photographs of streets and buildings, possibly at the request of business friends. 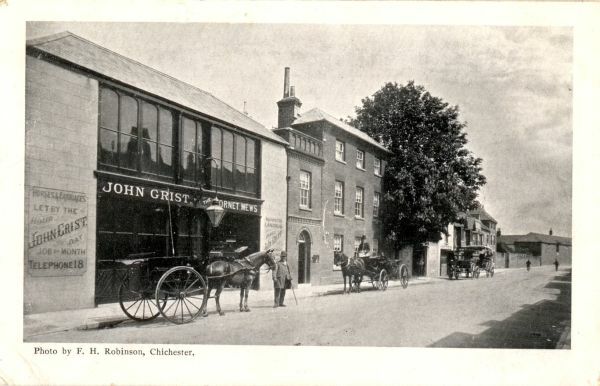 The halftone postcard shown above is marked "Photo by F. H. Robinson, Chichester" on the front and may have been intended as an advertisement for John Grist's horse and carriage business in the Hornet, a street just south of St Pancras. A second halftone shows the Eastgate Brewery shop frontage and a third Elizabeth Johnstone's Girls School on the corner of St Pancras and New Park Road. Two more halftones (see Gallery) record the exterior and interior of the Balls Hut Inn at Fontwell near Arundel, and may have been commissioned by the proprietor, William Albert Rogers. A 1906 postmark has been reported. Utilising a slightly different negative was a collotype version of one of the cards, which was in circulation by 1905. A halftone card of the Depot Band of the Royal Sussex Regiment at Chichester probably dates from about the same year. For further details of Frederick Robinson's life and photographic work see David Simkin's website http://photohistory-sussex.co.uk.